EL PASO, Texas (CNS) — Against a political backdrop in which immigration has been spotlighted, the dioceses of El Paso, Las Cruces, New Mexico, and Ciudad Juarez, Mexico, hosted their annual border Mass. The Mass, usually concelebrated just north of Juarez and west of El Paso in nearby Sunland Park, New Mexico, was forced to move. Normally it is held in a large lot of compacted sand, able to hold hundreds of attendees. 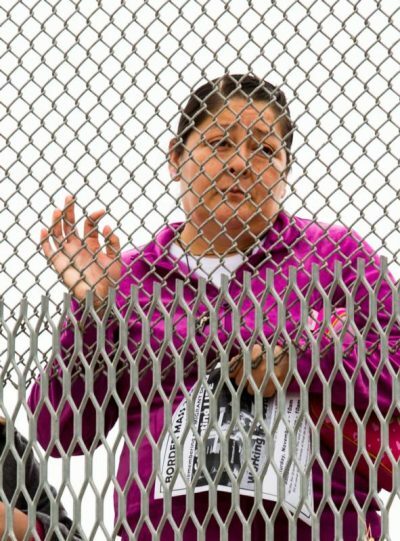 Many will come to lock fingers through a chain-link fence with loved ones on the Mexican side. But over the summer, the U.S. Border Patrol began construction on a large, 18-foot steel fence meant to obstruct those trying to cross the border from Mexico into the United States illegally. The Mass was moved to the literal divide between the two countries — the Rio Grande River. “Borders are part of life,” El Paso Bishop Mark J. Seitz said in his homily. “Borders give us a sense of orientation, a sense of order in the world. There are natural borders, like those we could easily see from where we were gathered, such as mountains and rivers. But how we understand borders says a lot about us. Though normally dry at this time of year, a massive rain and hailstorm the night before that triggered tornado warnings left the canal with a foot of silty water. There would be no “meeting in the middle” for Bishop Seitz and Msgr. Rene Blanco, vicar general of the Ciudad Juarez Diocese. Instead, Massgoers found themselves separated. On the Mexican side, about 100 people, many carrying white crosses for those who have died or the banners of various Central and South American countries representing immigrants from those areas, sang and danced on the concrete embankment. Behind them, city buses zoomed past as shoppers made their way to markets and cyclists enjoyed the crisp morning. It was different on the American side. The U.S. Border Patrol allowed just a select few to be near the water with a majority of the 50 or so Catholics waiting to attend Mass forced to stand above the embankment and behind a chain link fence heavily guarded by Border Patrol. The two sides used microphones and large speakers to share the readings and responses. “Hopefully they know we are with them even if we can’t be close,” said a religious sister who asked that her name not be used. The Mass came three days before the U.S. presidential election in which the two candidates clashed on how to address the influx of immigrants into the country. Republican candidate Donald Trump launched his campaign in June 2015 with a speech in which he labeled Mexican immigrants who enter the U.S. illegally as “rapists” and criminals. He also has suggested building a wall between the U.S. and Mexico. Democratic nominee Hillary Clinton has said she supports comprehensive immigration reform. Bishop Seitz believes there is a larger border that must be kept in mind. “The most extreme border of all is that between God and his creatures, between heaven and earth. God chose out of love to cross that border by himself being born as one of us and thereby entering our life with all its brokenness and pain. In so doing he made it possible for us to cross, to pass over to the place where God dwells,” he said.